The Premium super-slim profile and sleek screen of the Samsung LED Monitors offer a sophisticated frame in front and a shimmering back panel. 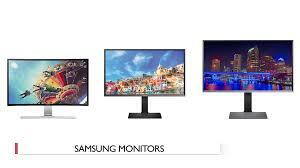 As an industry-leading LED monitor, Samsung's professional monitors provide creative professionals with the ultimate viewing experience for improved creativity, efficiency and engagement. Disclaimer: Every effort has been made to ensure the accuracy of all information contained herein. Virtual Micro Technology makes no warranty expressed or implied with respect to accuracy of the information, including price, product editorials or product specifications.